Hyenas are predators who have a profound impact on the ecosystems within their habitats and ranges. These African carnivores can grow up to 175 pounds. 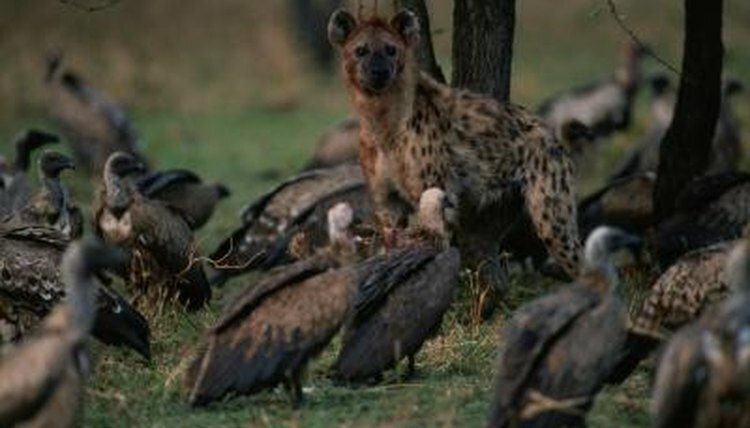 Hyenas are social animals who sometimes work in groups to hunt prey larger than themselves. Taxonomical family Hyaenidae contains four species: three hyenas and the similar but smaller termite-eating aardwolf (Proteles cristata). The most familiar species, the spotted hyena (Crocuta crocuta), is found throughout sub-Saharan Africa and occurs at high densities in the Serengeti and Ngorongoro crater. The brown hyena (Hyaena brunnea) lives in the arid habitats of southwestern Africa, including the Namib and Kalahari deserts. The striped hyena (Hyaena hyaena) is found in Eastern and Northern Africa and ranges into the Middle East, India and Russia. The striped hyena is forced to live in rock outcrops, mountain forests and other habitats when living within the range of the larger, spotted hyena. Vegetation varies widely throughout hyenas' range. Much of their range is characterized by a long rainy season and a three- to six-month dry season. The primary determinant of the local vegetation is annual rainfall. Areas receiving 3 feet of rain or more are often forested; as rainfall averages decrease the distance between trees increases. Twelve Acacia species are found in the Serengeti, including the umbrella-thorn (Acacia tortillis), with its large thorns to ward off giraffes (Giraffa camelopardalis), and the whistling thorn (Acacia dreparalobium) that lives in symbiosis with four or more species of ant. The pods of Acacia trees are often eaten by herbivores like kudu (Tragelaphus sp.) and impala (Aepyceros melampus). Grasses form important food sources for most of the herbivores in the region, including: Fine thatch grass (Hyparrhenia Filipendula) – which is most palatable early in the season – and foxtail buffalo grass (Cenchrus ciliaris) which is a favorite browse year-round. Over 1.6 million large herbivores live in the Serengeti ecosystem, and most of these engage in a yearly migration spanning hundreds of miles. Nearly 1,000,000 of these animals are wildebeests (Connochaetes taurinus) and almost 250,000 are Thompson’s gazelles (Eudorcas thomsonii) -- both are important prey species for Hyenas. Additionally, giraffes and even Cape buffalo (Syncerus caffer) are potential prey for a large pack of hyenas. Hyenas share their ranges with lions (Panthera leo), leopards (Panthera pardus) and African hunting dogs (Lycaon pictus). Hyenas must respect these formidable predators: Careless or young hyenas may be eaten by these sympatric hunters. Lions and hyenas have a complex relationship; the differing species often end up competing over the same kill site. The species with the greater numbers usually prevails, chasing off their adversaries. Black backed jackals (Canis mesomelas) and hooded vultures (Necrosyrtes monachus) often appear at kill sites. Hyenas are usually able to chase off the smaller predators so they get to the choice parts of the carcass first. Hyenas are smart and observant animals who sometimes use the presence of these animals to find carrion. What Is the Wild Horse's Ecosystem?